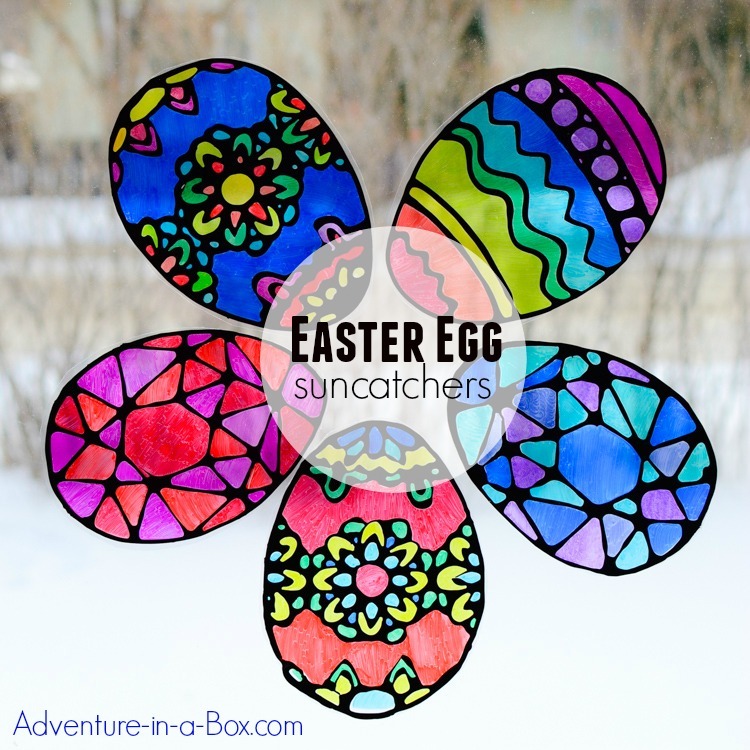 Make stained glass Easter egg suncatchers with kids! 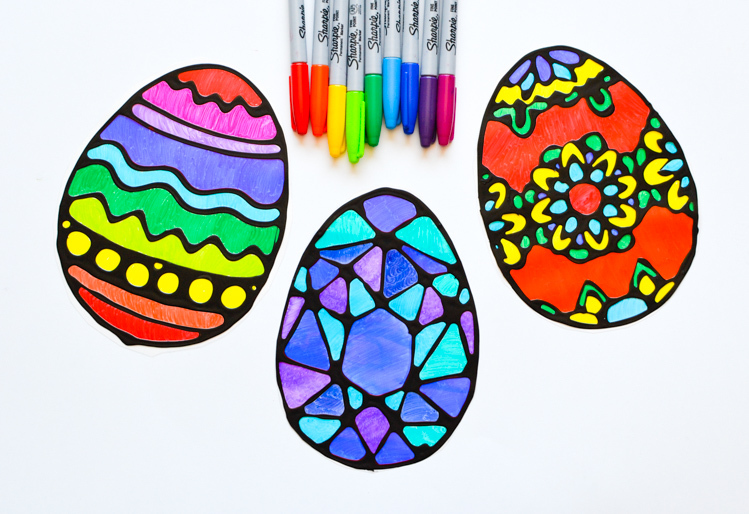 This craft comes with four free printable Easter egg designs and makes for a quick and easy way to decorate windows for Easter. 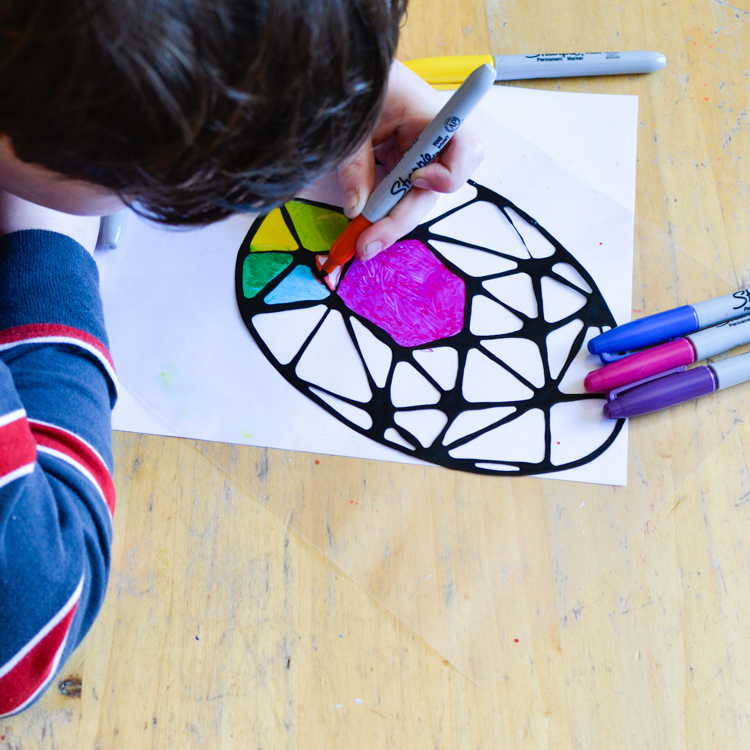 We enjoy making stained glass suncatchers with kids. They so are easy and cheap to make that once we get started, we fill our big front window with colourful designs in no time at all. It is also a pretty convenient way to decorate the windows and feel like we’re ready to celebrate whatever is to come. The kids can colour them however they want, as long as we have enough markers, and I also find the process to be entertaining. The finished suncatchers give our front room a festive look. 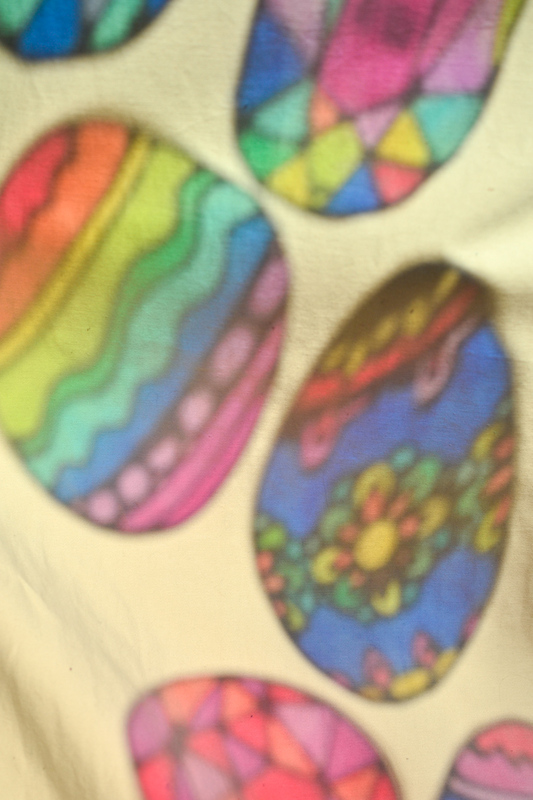 If the sun is shining through the window, our egg suncatchers throw cheerful reflections on the walls and curtains. What is black glue and how to make it at home? 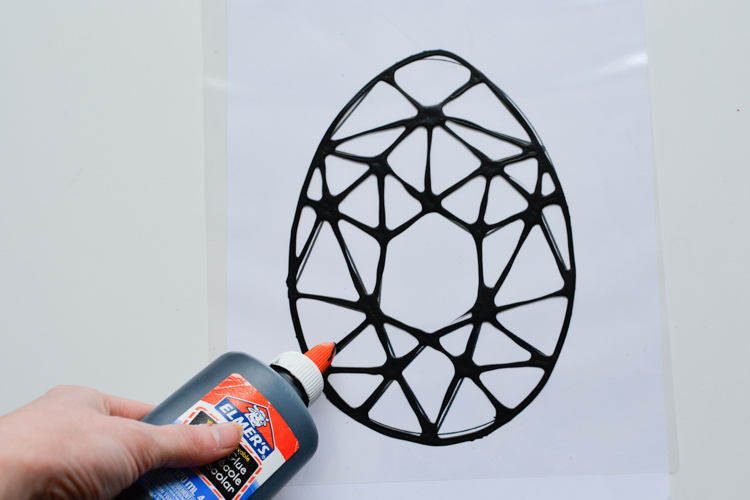 The idea is to mix black acrylic paint with white Elmer’s glue, and then use the bottle with a nozzle that the glue comes in. The combination of acrylic paint and glue results in a mix that flows smoothly (more so than if you used straight acrylic paint!) and dries into slightly raised lines (easy to colour inside). It’s a lot cheaper and overall better than dedicated stained glass leads you can buy, but you can try those as well. Pour the excess glue into an empty yogourt container. Glue can be used for a different art project or simply applied with a brush when you need to glue something. My proportions are approximately 1:1 – one part glue to one part paint. I pour half a bottle of glue out and substitute it with black acrylic paint by squeezing it right into the bottle. After that, I shake the bottle of glue for about one minute, then squeeze a little bit on a scrap piece of paper to get rid of the white glue that could have accumulated in the nozzle. Besides the black glue, you will need some piece of clear plastic – use an empty plastic container from the store (the kind of clam shell package they sell fruits and pastries in), a plastic folder with clear sheets or an empty laminating pouch that has been run through a laminator. 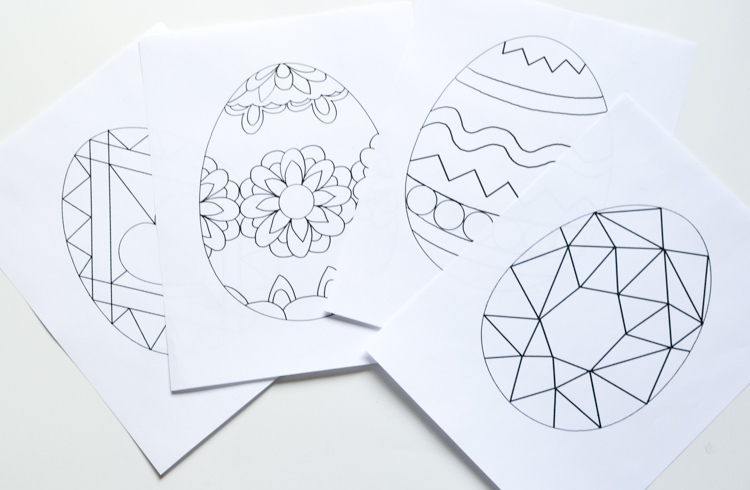 You will also need a design – you can download our free easter egg templates at the end of the post. 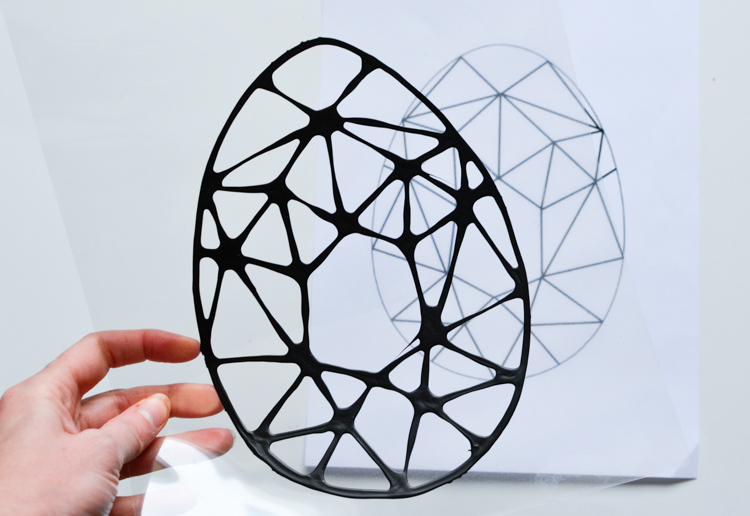 1 — Print the design and slip it under the piece of plastic. 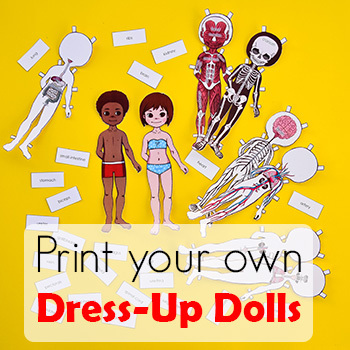 You can even tape it to the plastic piece to keep them in place, which is particularly useful if a kid is doing this part. 2 — Drawing the outlines is relaxing. You can influence the boldness of lines by how hard you squeeze the bottle. And sometimes you don’t need to squeeze at all, but just guide where the line goes. Watch the video to see it done! Let the finished piece dry overnight or for about eight hours. The raised outlines created by black glue present very compelling borders, making it very easy for young artists to colour. They are also thick enough not to let the light through, therefore giving a convincing stained glass effect. 3 — Now, how to colour the clear plastic? The easiest and cheapest way is to use sharpies. My son can colour with them without difficulty, and the result is vibrant and consistent! NB: In the direct sunlight, sharpie-coloured suncatchers fade in about 30 days. Since we do this craft for seasonal decor with my kids, this time frame is just about perfect for us to enjoy the suncatchers, then take them down and make new ones! 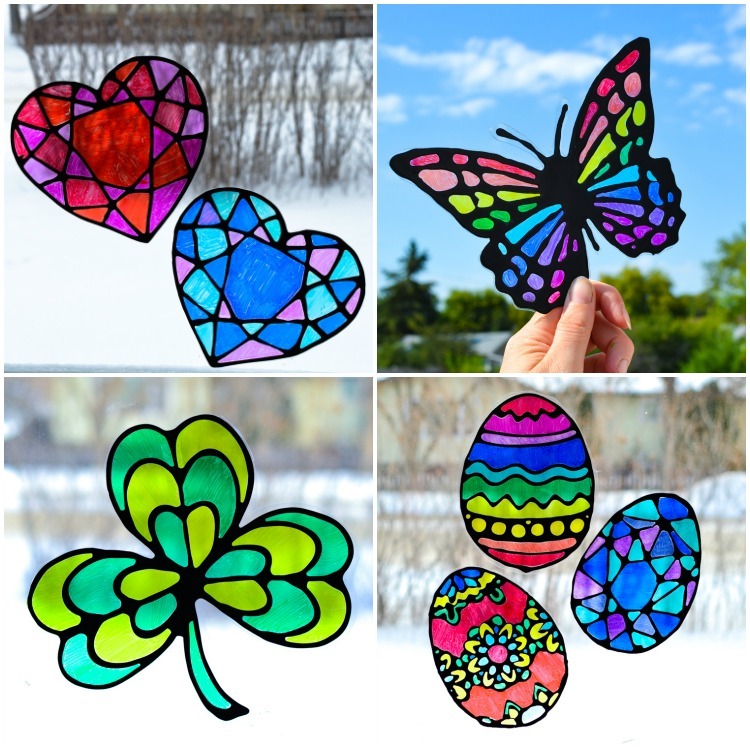 If you want something more permanent, use special stained glass paints. 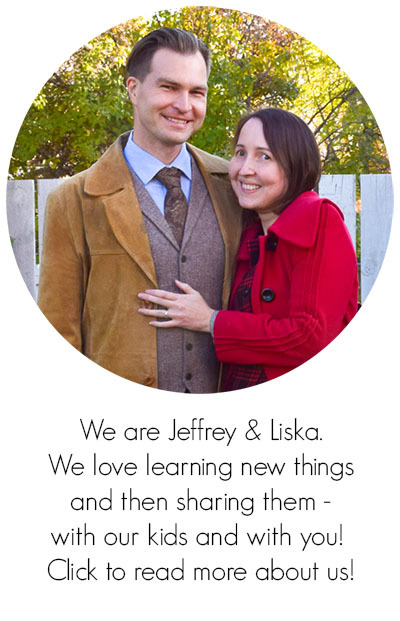 They’re also easy to use: we made a project with them here. My son is working on his egg. And these are some of our finished eggs. 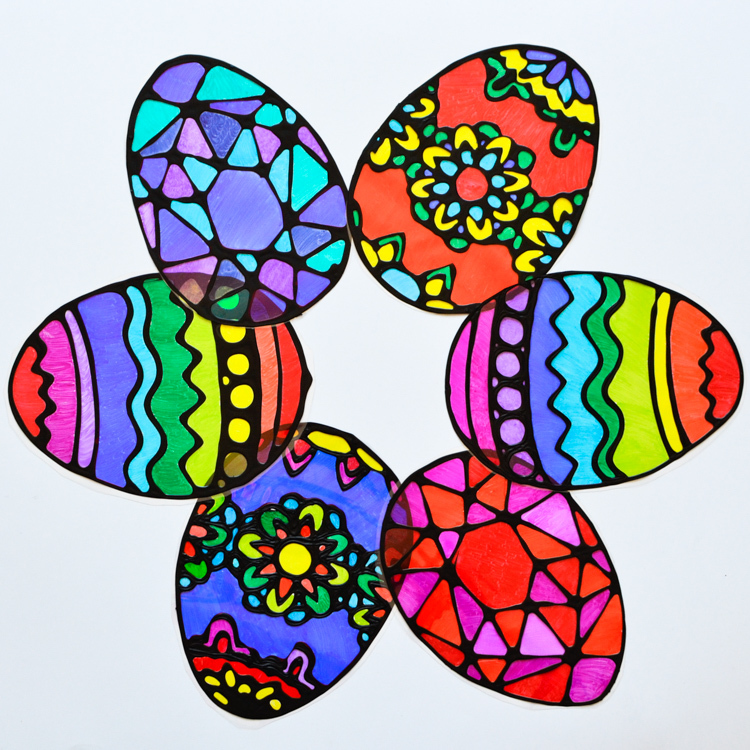 4 — After you’re done colouring, cut the egg shape out. 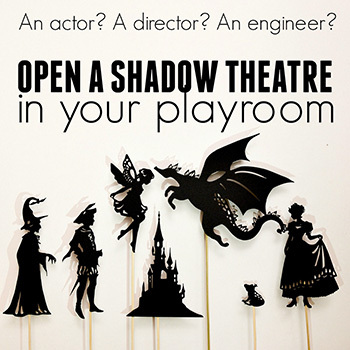 Since the surface we painted on is translucent, you don’t need to cut very close to the lines.As a result, even children who aren’t expert at using scissors can do a good job! 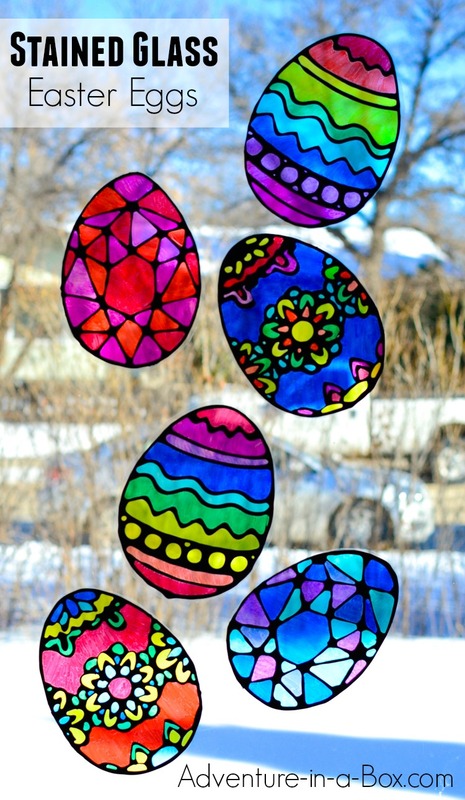 5 — Use a double-sided tape and stick the suncatchers onto the window. I made four templates, but once they get painted in different colours, it looks like there is an even bigger number of designs! Download them below. 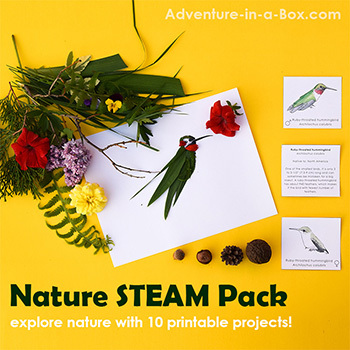 Get the Free Printable Designs Now!